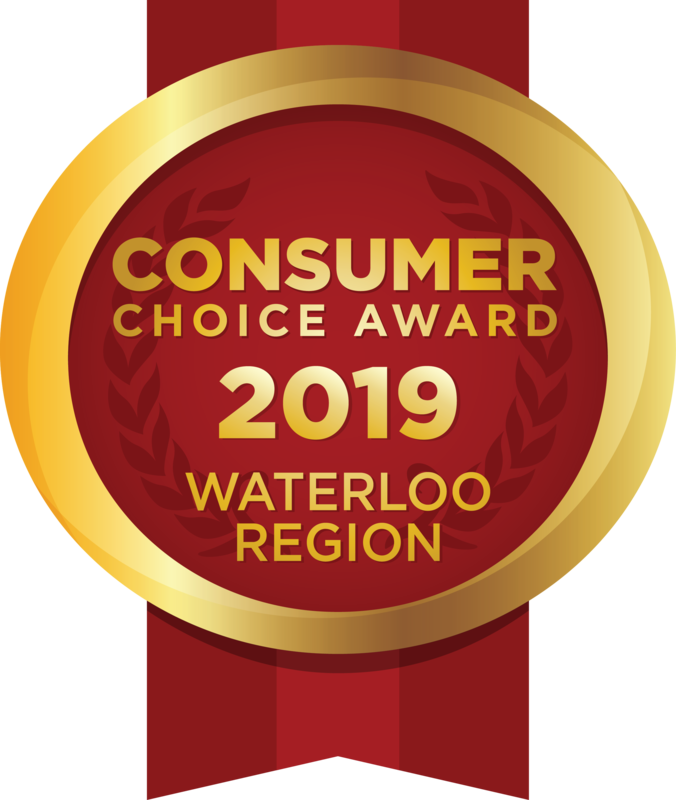 KW Countertop is a locally-owned retailer and installer of laminate, granite, quartz, and solid-surface countertop surfaces, operating since 1997. 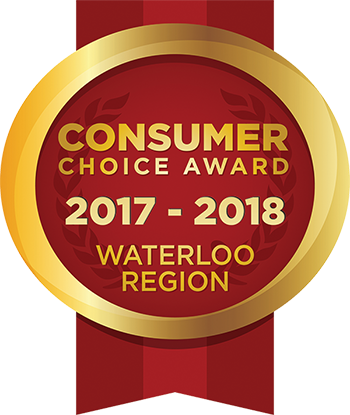 Centrally located in Kitchener, visit our spacious countertop, sink, and faucet showroom, our 10,000 square foot Mega Gallery, and state-of-the-art manufacturing facility. 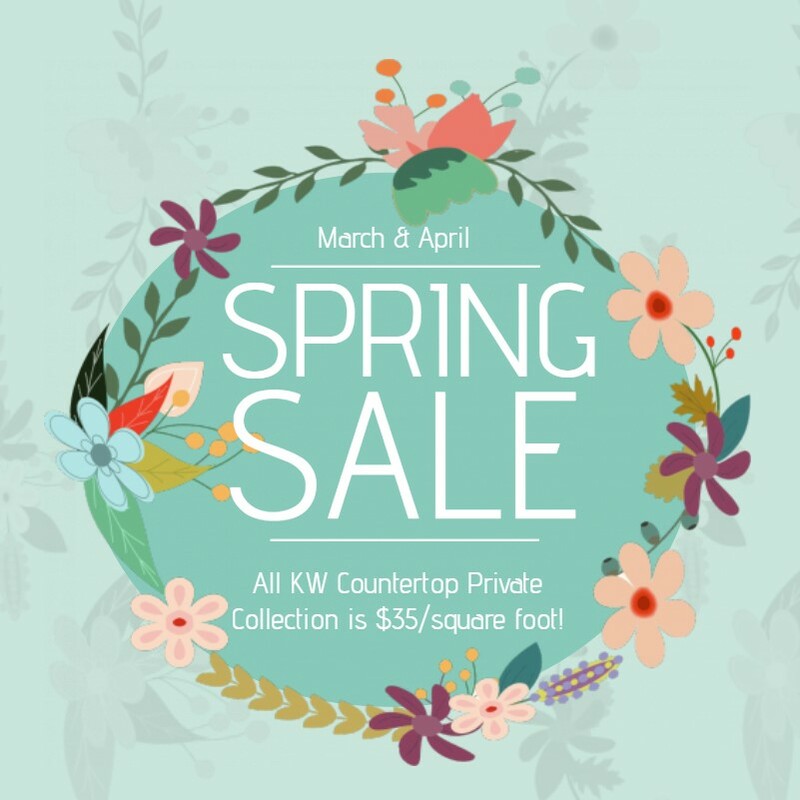 All of our KW Countertop Private Collection quartz is on sale for only $35/SqFt! This price includes your measure and install. Stop in any day to view the slabs in our Mega Gallery! We also have great deals on our Top Selling sinks and faucets! They are available to view in our showroom. We are open 7 days a week so you can receive expert advice, and receive a quote when it is convenient for you. 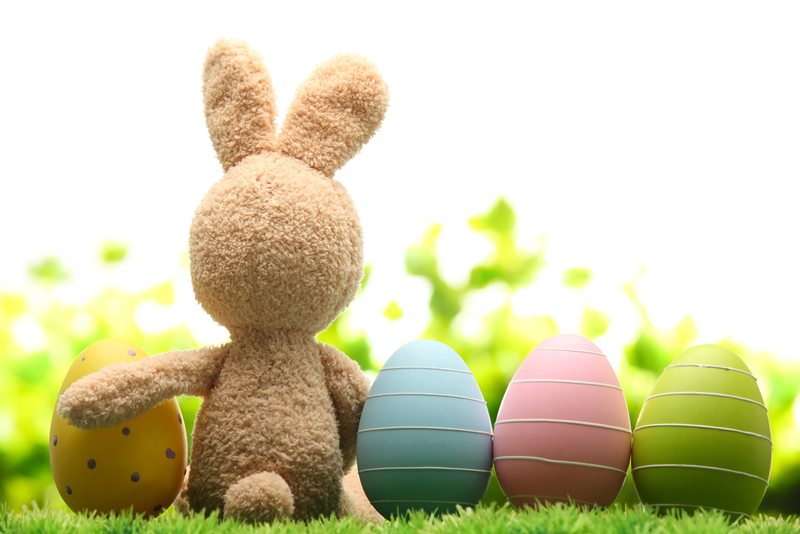 Please note that we will be closed on Friday, April 19, and Sunday, April 21, for the Easter holiday. Granite countertops are slabs of dense, quarried stone. Mineral crystals in the stone such as mica and feldspar create granite’s speckled patterns and colour. Each granite countertop is unique, so store samples may vary from cut slabs. Quartz countertops are manufactured slabs of dense acrylic filled and patterned by crushed, natural stone—usually quartz. Patterns can look very similar to granite and marble, but with more consistent colour and patterning. They can also look very unique. Manufacturers make quartz countertops in hundreds of patterns and colours by varying their recipe. 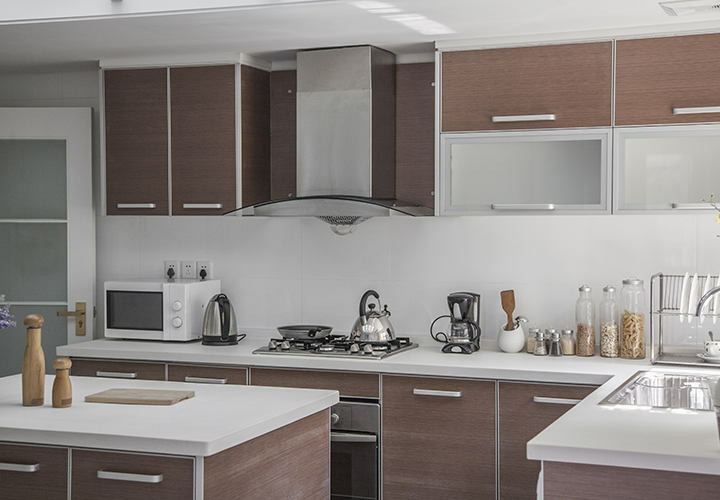 Laminate countertops are a base of dense layers of particleboard or wood product with a top, veneer layer of patterned polymers. Laminates can take on almost any appearance − stone, wood, bamboo, tile, metal − because manufacturers can insert any pattern into the veneer layer. This is now my second countertop from KW Countertop. The staff, both at the showroom & the installing crews are professional, courteous and knowledgeable. We have always been pleased with the quality of the counters, the install, the cost & the timing. I do not hesitate to recommend to my friends and family. We recently had a new countertop installed. 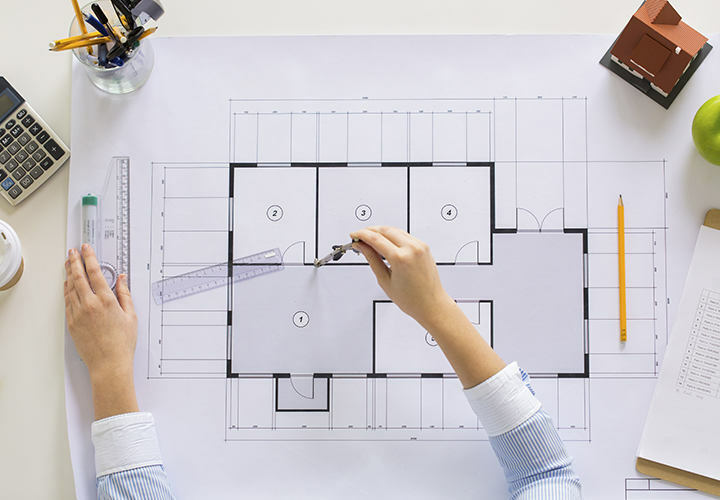 The entire process, from the first phone call we made, to meeting with Lisa in the showroom, to having the measurements taken, to having the installation completed was excellent. All of the staff are friendly, professional and passionate about their jobs, which makes a huge difference. We love our new countertop and will definitely be repeat customers! Thank you for the outstanding service and product! Not having any experience I ventured in to your showroom and within 3 weeks have a beautiful countertop in my new kitchen! Fantastic service from the sales rep to the installers! I have already recommended you to 2 other people and it's the first hour of using it! I would not hesitate to recommend KW Countertop. From the salespeople to the countertop measurer to the installers, all were professional, courteous, on-time. The counters fit perfectly - all of this added up to making our kitchen reno a far less stressful experience. Jeremy and Manny were very helpful, answered all the questions I had and both had huge smiles on their faces during the entire install. Counter looks great and they installed it so quickly and professionally. Thanks guys! I hope whoever sees this let’s you know you guys were awesome. Happened to go on the first Sunday they were open - lots of staff- great service and good advice. Came the next day to measure and had our product the following week. Appreciate the quick and friendly service. Would recommend KW Countertops, the sales, installation staff were very helpful, informative & professional. The counter fit perfectly, not one tiny gap anywhere like others I have seen. Their price was also lower than their competitor, Would definitely use them in future. We ordered new Quarz countertops from KW countertops. This has been a very rewarding experience, from Lisa in sales, who advised us on what’s available, to Marco, Manny and Chris who did the installation. They laid out carpets to protect our flooring, removed the old countertops and installed the new ones, including a new sink. We can highly recommend KW. * Pick-ups 9:00 am to 5:00 pm. No pick-ups on Saturdays or Sundays.